By Graham Vanbergen: The predictions are now coming in thick and fast. It appears that there is a foregone conclusion that 2020 is the date that crash 2.0 will wreak havoc once again. Nouriel Roubini, (3) a professor at NYU’s Stern School of Business, a Senior Economist for International Affairs in the White House during the Clinton Administration, has also worked for the IMF, the US Federal Reserve, and the World Bank. In other words, Keynesian economics has just failed. Few governments were able to save anything from the last crash to pay for the next one. William White4 is a former deputy governor of the Bank of Canada and former head of the Monetary and Economic Department of the Bank for International Settlements. White focusses more on recent monetary policies that have seen a continuous increase in the ratio of non-financial debt to global GDP. He quite rightly points out that debt has piled up worldwide, with the most significant increases found in emerging-market private sectors. Again, over-inflated assets such a stocks and property feature in the critique of these economic experts and all are looking not to be caught out in the “we didn’t see it coming” camp like last time. There is now talk of “covenant-lite” loans – the loans lacking many basic protections for the lender that created the environment for excessive risk-taking. This was how it was in 2008 – lending to high-risk demographics. Richard Kozul-Wright, Director of the Division on Globalization and Development Strategies at the United Nations Conference on Trade and Development, takes a slightly different angle on the coming crisis. But in the end, it all amounts to the same thing. He says an under-regulated, or more importantly and unregulated “shadow banking” system has grown into a $160 trillion business. That is twice the size of the global economy. Andrei Shleifer, the well-known Professor of Economics at Harvard University says that none of the lessons learned from the crisis of 2008 has been learned, irrespective of what various governments have said they have done. Interestingly, what Shleifer says more than anything was that the last crash was indeed predictable and therefore so should the next one. He, of course, comes to the same conclusions, there will be a crash, but for different reasons. My point is much simpler. I predicted the 2008 crash and moved all money away from stocks and invested some of it in precious metals. At the time, my worry was that growth was being fuelled by debt, not by production or rapidly rising wages (of which neither was actually happening) being recycled back into the economy. I thought that the market was built on bluster and overconfidence. It was as it turned out, a bank-led confidence trick. They bet bigger than ever before and gambled that the bailouts would come – and they were right. In 2018, global debt has risen to an eye-watering $250 trillion. Growing from just over $140 trillion in 2008 – this number is now more than 300 per cent of 2018’s expected annual global output of $87 trillion. Again, increased production and rising wages have not featured as the primary driver of growth, but debt has. Kozul-Wright rightly mentions that “emerging markets’ share of the global debt stock rose from 7% in 2007 to 26% in 2017, and credit to non-financial corporations in these countries increased from 56% of GDP in 2008 to 105% in 2017.” He also rightly mentions that these economies are much less likely to be able to cope with any downturn. Nomi Prins, the Ex MD at Goldman Sachs, now a journalist who writes about Wall Street and the American economy, comes up with a similar but more focused reason for the spark of the next crisis. She thinks the four-pillars of debt is on the verge of collapse. Household consumer debt has hit all-time highs. So has credit card debt and student debt (now the second highest debt held in the U.S.) and finally auto debt. Interestingly, auto debt in the U.S. has not just reached a new peak, delinquencies have now overtaken that of 2008 peak as well. This is much the same in the UK. And so it appears that most economic pundits are going with 2020 for the global crash to return on all of the aforementioned. And they are all valid reasons. 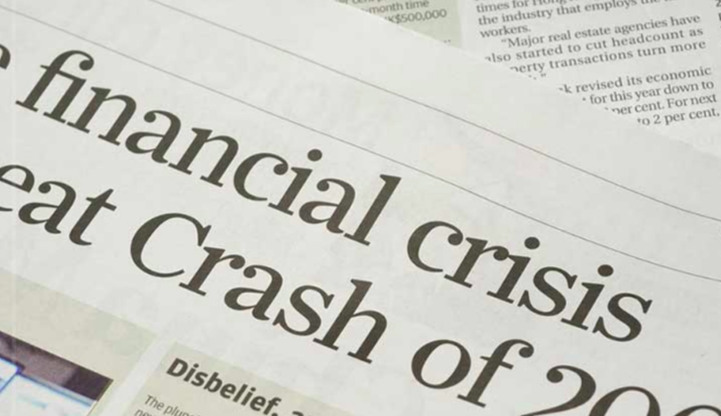 My view is that the next global crisis has already started but that recessions begin where we are not looking and by the time we notice, it’s too late. We also like to tag an event to downturns like the false assumption that Lehman’s was the epicentre of the worst economic crash for 100 years. The reality is that Lehman’s was just a political scapegoat for the under-regulated neoliberal markets of the day that over-extended itself. It was all smoke and mirrors. What happened then will happen again, as regulation has not fixed the underlying problems, only this time the responses to it will be muted out of a lack of available resources and that is, of course, a worry. There is a bigger worry, though. The result of new bailouts will this time be utterly intolerable, especially in countries with resurgent populist movements and their near-insolvent governments. And this time, as a direct result of 2008, there are many to choose from. The fallout could be as game-changing this time, as it was last time. Take your pick from the many triggers that could be blamed. Threatened, if not real trade wars, geopolitical tensions, imploding consumer or corporate debt, shock elections, readjusting asset prices, Brexit, a destabilised EU, rising interest rates, inflation. The expected 2020 crash already has a foot in the door because the experts are already warning it will be so – confidence is rapidly waning. By summer next year, the global markets will have an undeniable new trajectory.